He hōnore, he korōria ki te Atua, he maungārongo ki te mata o te whenua, he whakaaro pai ki ngā tāngata katoa. Kia tau iho ai te manaakitanga a te runga rawa ki runga ki a Kīngi Tūheitia me te whare o te Kāhui Ariki nui tonu, rire, rire, hau. Paimārire. E ngā tini mate o te wā, koutou kua huri ki tua o te ārai, moe mai rā i te kāinga tūturu o tātou, te tangata. Rātou ki a rātou. Tātou te hunga ora ki a tātou. Mai i Hautere ki Pōhaturoa, Nukuhau ki Tītīraupenga, Wharepūhunga ki Maungatautari, tae noa ki Te Wairere, arā te taha rāwhiti o Raukawa. Tēnā tātou katoa. Tēnā hoki koutou kei nga kaiārahi o ō tātou marae maha, kei ngā kaipupuru mauri, mōu e whai whakaaro nui nei ki te āpōpō, tēnā koutou. As the Chairperson of the Kaunihera Kaumātua, I warmly welcome you to our iwi website. It is a place to connect with your Iwi, and to learn more about the many initiatives that our Iwi organisation offers to help support and grow our people. I encourage you all to take the time to browse through our website to learn more about the mahi that we do. The birth of Raukawa is a long and significant story. Though it is not the purpose of this site to reproduce our history in full, it is important to deliver a short summary of this kōrero to provide some insight in relation to Raukawa our ancestor, the Raukawa iwi and our takiwā. It is also significant that embedded within our stories, memories, and geographies are roadmaps for the expression and practice of values and tikanga for both the present and the future. A comprehensive history of Raukawa beyond that of the Treaty settlement process is currently being written. Raukawa was a descendant of many tūpuna. Through his father Tūrongo his descent traces directly back to Hoturoa the captain of the Tainui waka. Hoturoa is an important ancestor, featuring prominently within the cultural memories of Raukawa. Hoturoa was the captain of the Tainui waka, is also the father of Kahukeke. Kahukeke married the Tainui tohunga, Rakatāura, another important ancestor of Tainui. Raukawa was also a descendant of Rakatāura and Kahukeke. Raukawa was born about 20 generations ago within the Kaimai region and grew up at his father’s home of Rangiātea, near Ōtorohanga. Early tribal history centers on the children of Raukawa – Rereahu, Whakatere, Kurawari, and Takihiku. These ancestors are marker points in Raukawa history. The story of Raukawa has been immortalised through the story of his father and his mother Māhinaarangi, the beautiful maiden of the East Coast and descendant of the Takitimu waka. Māhinaarangi means the moon glow of heaven. Tūrongo traveled from Kāwhia to the east coast to pursue the beautiful maiden Māhinaarangi. It was under the cover of darkness that Tūrongo expressed his love and desire for Māhinaarangi who wore the special fragrance of the Raukawa oil. With his courtship complete, Tūrongo then returned to his homelands. He constructed a house for Māhinaarangi and their unborn child at Rangiātea on the banks of the Manga-o-Rongo stream. Though, Māhinaarangi remained with her people until late in her pregnancy, she desired her child be born in the lands of her husband. Eventually the time arrived for her to begin her epic journey to these lands. Māhinaarangi set off on her journey with whānau on hand to accompany her. Amongst her accompanying whānau was Waitete, Tūrongo’s dog, who was to act as a guide to ensure a safe journey westwards. The journey was long and they traversed many lands of other hapū and iwi. Māhinaarangi gave birth to a son on the western side of the Kaimai ranges at a place called Whenua-ā-kura. Māhinaarangi fed her new baby in this location, and is commemorated in the naming of Ūkaipō Marae. It is not known how long she rested after the birth of her son, however the naming of numerous places between the base of the Kaimai and her new home at Rangiātea suggests it was not long before she continued on her journey towards her new home. When they crossed the Waikato River, at the point now known as The Narrows, Waitete left the group to find Tūrongo and announced the arrival of Māhinaarangi and their son. Tūrongo was overjoyed when he saw his son and keen to take them both back to his homelands. They all continued on their journey and upon finally arriving were welcomed by Tāwhao, the father of Tūrongo, to their new home on the banks of the Manga-o-Rongo River. It was here that Tāwhao performed the Tohi ceremony on his grandson and the baby was given his name, Raukawa, after the perfumed oil his mother wore in her courtship with his father. The Raukawa takiwā is from Te Wairere, Horohoro, and Pōhaturoa. At Ōngāroto is the house of the ancestor Whāita. From Nukuhau to Taupō-nui-a-Tia, to Hurakia on the Hauhungaroa Range. From Titiraupenga mountain, the horizon is the boundary of the district of Raukawa. To the mountain Wharepūhunga and the marae at Arowhena. To the ranges of Whakamaru. The view extends to the region of Te Kaokaoroa-o-Pātetere. To Maungatautari. The view extends beyond Wharepūhunga to the ancestor Hoturoa to the marae at Pārāwera. Over time, the takiwā of Raukawa has been divided into four rohe, each with their own unique, but interrelated, histories and geographic features. These rohe are Te Kaokaoroa o Pātetere to the east, Te Pae o Raukawa to the south, Wharepūhunga to the west and Maungatautari to the north. Today Marae within the Maungatautari area represent their own intersts outside of the Raukawa Settlement Trust mandate. We also acknowledge Ngāti Raukawa ki te Tonga who settled the Ōtaki, Manawatū, and Waikanae area and have chosen to represent their own interests. The Raukawa takiwā comprises some 530,000ha. This is a reflection of Ngā Uri o Raukawa interests acknowledged through contemporary governance arrangements and through various Co-management and Treaty Settlements. Similar to other Iwi our historical takiwā has shifted over time as our people reacted. The takiwā shares common interest with many other iwi, whose lives, stories and whakapapa are also interwoven with the landscape. Te Kaokaoroa o Pātetere literally means the long outstretched armpit of Pātetere, a name given also to the area where the Kaimai ranges intersect the Mamaku Ranges. Pātetere was a direct descendant of Raukawa through Kuri. His sister, Hautere, also has a sacred maunga named after her that is affiliated to Ngātira, Whakaaratamaiti and Mangakāretu Marae. Upon the amo of Ngātira Marae are depicted effigies of Pātetere and Hautere. 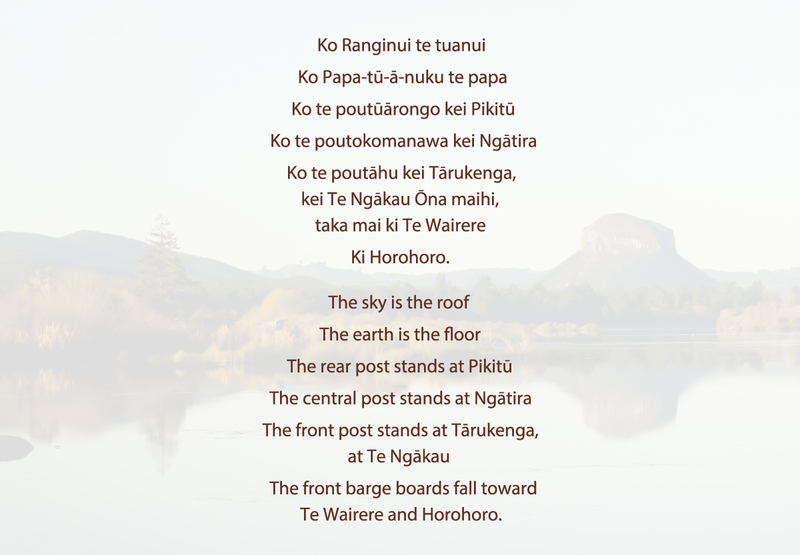 Today, the phrase Te Kaokaoroa o Pātetere applies to a much wider area, a geographical and spiritual boundary within Raukawa lands. The boundary commonly described for Te Kaokaoroa o Pātetere runs from Te Wairere in the north, down through those ranges into the Kaimai and Mamaku, and as far as Ngongotahā mountain near Lake Rotorua. From there it runs to the Horohoro Ranges, and then turns west to the Waikato River, though there is an overlap here with Te Pae o Raukawa. The boundary then runs across to the maunga Wharepūhunga and on to Maungatautari, then to Cambridge, where it swings north-east, back up to Wairere. Te Kaokaoroa o Pātetere was a large tract of land that, with the introduction of the Native Land Courts, was divided into a number of smaller land blocks. Te Kaokaoroa o Pātetere is an area particularly rich in the cultural memory of Raukawa. This oral memory stretches back to the time of Māhinaarangi and the birth of Raukawa in the Kaimai ranges. Many of the names within Te Kaokaoroa o Pātetere reflect the birth of Raukawa including Te Poitanga (now known as Te Poi), Te Waitikihanga a Māhinaarangi, and the marae Ūkaipō. This marae was named to commemorate the feeding of Māhinaarangi’s newborn child at the beginning of the Arapohatu. Te Kaokaoroa o Pātetere is also significant as it contains what is metaphorically described as the Spiritual House of Raukawa. Te Whare Wairua o Raukawa links up the marae of Raukawa. This is a metaphysical house that sits across the takiwā of Raukawa. The whatitoka (door of the house) stands to the east, at Tārukenga Marae near Lake Rotorua. The back of the house is located at Pikitū Marae, Waotū, near the Waikato River, although it extends across the river to the mountain named Wharepūhunga. The central pole of the house stands at Ngātira Marae. The arms of the house stretch from Tārukenga northwards to Wairere, and southwards to the Horohoro bluffs. From this west-to-east lying ridge pole spreads the ribs of the house to the other marae of Te Kaokaoroa o Pātetere. This kōrero appears to have developed in the nineteenth century with the influence of Tāwhiao, as a way to help bind the associated communities together to resist land sales and other destructive forces of colonialism. The kōrero is reproduced below. Within Te Kaokaoroa o Pātetere lie a great number of geographical features. A wide range of natural environments and resource centres exist throughout Te Kaokaoroa o Pātetere, with a multitude of historical pā, kāinga, mahinga kai, and other sites of significance. The region encompasses three watersheds running respectively into Lake Rotorua, the Waikato River, and the Te Waihou River as well as significant maunga, and the Kaimai and Mamaku ranges. Te Waihou River in particular and its origin as a puna (spring) within the Mamaku range has been a critical part of Raukawa life for centuries. Te Waihou emerges from Papa-tū-ā-nuku, near the sacred maunga of Hautere, and mysteriously appears and disappears as it meanders through the deeply incised valleys toward Okoroire. The water source itself is a significant and important ground water aquifer that sits within the Mamaku/Tokoroa area and is very old, with very high quality water. Te Waihou has provided a rich source of both resources and connection with other iwi for generations. The Ōraka, Ōpouaru, Mangatapu, Mangawhero, Rapurapu, and Māhinaarangi (Te Waihou feeder streams); the Ngutuwera, Pōkaiwhenua, Little Waipā, Whakauru, Matarawa, Mangaorua and Piarere (Waikato feeder streams) are but a few of the complex web of waterbodies within Te Kaokaoroa o Pātetere. The puna of the Mamaku/Kaimai Ranges, and indeed across the takiwā, have been valued as taonga for generations and are celebrated in both Raukawa oral history and cultural associations. Raukawa view Te Pae o Raukawa as one of the rohe or districts of Raukawa, Te Pae o Raukawa includes a substantial area of land running from the Tokoroa and Whakamaru, Maungaiti area in the north, across to Maraeroa and through the Pouakani lands, and south to the lands bordering the north-western shores of Lake Taupō, including Tātua and Whangamatā, Te Tihoi, Waihāhā, and Hauhungaroa. To the east, Te Pae o Raukawa extends across the Ōhākurī, Horohoro, Ōrākei Korako, and Tahorakurī areas. This broad geographical area contained an equally broad range of environments and ecologies, including the Waikato River (Including its tributaries such as the Mangaharakeke Stream) and neighbouring swamp lands, the bush-clad and bird-rich mountains of Whakamaru, Titiraupenga, and Te Tarata, to name but a few. Fern-lands and plains such as were found at Pouakani, the thermal resources at Ōrākei Korako, as well as further south to the Reporoa and Wairākei, and of course the fresh-water resource of Lake Taupō at places such as Whangamatā Bay. The area was abundant with the bird life that Raukawa were well known for, as can be seen in the provisioning of birds for a significant hui at Pūkawa in old times. According to some, Te Pae o Raukawa got its name from Māhinaarangi, who, while crossing the Kaimai Ranges to join her husband Tūrongo, looked out at the lands around her. She could see Maungatautari and Wharepūhunga to the west, as well as the area that came to be known as Te Kaokaoroa o Pātetere below her. When looking to the south the young Raukawa kicked within her stomach, to which she said: Ka takahi e koe ōu waewae kei runga i te Pae o Raukawa. In the generation of the grandchildren of Raukawa a number of significant battles took place with the Ngāti Kahupungapunga through Te Pae o Raukawa. One of the most notable was at Pōhaturoa Pā near Atiamuri, where the Ngāti Kahupungapunga gathered to resist the invaders but were defeated at great loss of life. The great standing stones at Ōngāroto where the bodies of the slain were cooked could still be seen in the latter part of the nineteenth century and are present today though they are now obscured by pine forest. These lands bordering the Waikato River became a centre of Raukawa settlement and expansion, with descendants of Ūpokoiti, Whāita, and Wairangi in particular taking residence there. Occupation also took place in the Maraeroa area in the generation of Poutū, son of Whakatere, as an extension of the southern movement of the descendants of Raukawa following the path of the conquest, while descendants of Rahurahu occupied lands east of Tātua. It should be recognised that much of the southern extent of Te Pae o Raukawa, and certainly those lands bordering Lake Taupō, overlap genealogically with Tūwharetoa. 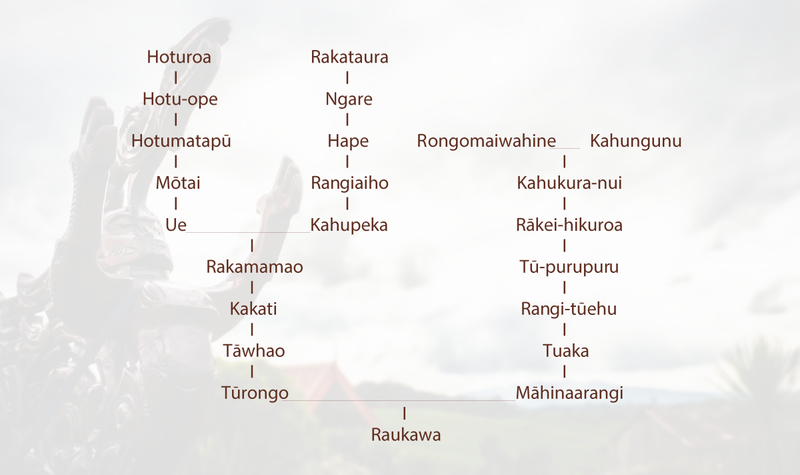 So while Raukawa may refer to these hapū as southern Raukawa hapū, Tūwharetoa may also legitimately refer to them as northern Tūwharetoa hapū. The Wharepūhunga rohe is named after the maunga of the same name. The name has an ancient origin. The name Wharepūhunga was given by Rakatāura, a tohunga on the Tainui waka, and his wife Kahukeke (daughter of Hoturoa). On their travels they named numerous geographical features in the central North Island. Wharepūhunga-o-Kahu was named after a shelter was constructed on the maunga for Kahukeke, where some say she and Rakatāura stayed as their son was born, whilst others say that she took ill and recuperated there. According to Williams, pūhunga means, to place on one side or lay up; hence the name Wharepūhunga-o-Kahu was given to this site. As a result of this illness, Rakatāura journeyed to a nearby mountain and performed the pure ritual as a means to cure her, consequently the name of the place became known as Te Pureora o Kahu. It was later, after they had left Wharepūhunga o Kahu, that Kahu took ill and died. The area also holds significance given that it is from this district that Raukawa and his descendants began their extension for additional lands that we now know as the Raukawa takiwā. Some nine generations after Rakatāura and Kahukeke, the lands east of Wharepūhunga were given to Tūrongo by his father Tāwhao, who was trying to allay the infamous dispute between Tūrongo and his brother Whatihua. It was within this district, at Rangiātea, that Tūrongo eventually set up home for himself, Māhinaarangi, and their children. Raukawa was raised here and while there is not a great deal known about his upbringing, Raukawa eventually married Tūrongoihi and had four children of their own Rereahu, Whakatere, Kurawari, and Takihiku. It is at Wharepūhunga that the tribal lands of Raukawa began. Some of his descendants left to conquer areas outside this district, particularly across the Waikato River and into the lands of the Ngāti Kahupungapunga, and secured what is now known as the contemporary boundaries of the Raukawa takiwā. There were a number of significant settlements established in this district by early settlers of the Tainui waka. The first of these settlements, Rangiātea, was located on the south bank of the Mangaorongo Stream, near Ōtorohanga. This wider region remained under the control of the descendants of Raukawa, notably those tracing descent from Rereahu, Whakatere, and Takihiku. This is evidenced by the many hapū that bear their names and the old pā sites they resided on. Takihiku established his pā, Tuataikawa, in the Wharepūhunga rohe. The geography of the area is also significant. For the most part the rohe conforms to the land block of the same name, which was originally part of the larger Aotea,or Rohe Pōtae, block, but was partitioned off and awarded in a separate title under various hapū of Raukawa in 1892. Bordered to the north by the Maungatautari block,mainly along the Ōwairaka Stream, the eastern edge of the Wharepūhunga block follows the Waikato River until it reaches Waipāpa, north of Mangakino and opposite Maraetai, where it turns inland towards a point named Te Pou-a-Kani. From there the block boundary runs in a south-west direction to its intersection with the northern-most point of the Maraeroa block, a peak called Taporaroa. The boundary then moves in a north-west direction to Pukeokahu, a peak in the Rangitoto ranges, and runs up through the ranges until it connects with the Mangatutu Stream. It then follows the Mangatutu Stream northwards until it merges with the Pūniu River, which itself forms part of the southern boundary of the Maungatautari Block. The Wharepūhunga block has a number of important water-ways within the Waikato River and Waipā catchments, including the Waipāri and Pūniu Rivers, and the Mangatutu, Mangakomua, and Mangare Streams. These all flow from the more mountainous and bush-covered southern portion of the block into either the Pūniu or the Waikato Rivers. In the south east of the block a number of tributaries to the Waipāpa River flow down from the range between Te Ranga and Taporaroa. Settlements active in the mid to late nineteenth century include Wharepapa, found to the east of the bush-covered peak Taurangakohu, near the Mangatutu Stream. The kāinga Hingaia is to the south-east of Taurangakohu, with Panetapu pā to the north. On the northern slopes of Wharepūhunga, between the Waipāri River and Mangakomua Stream, is Tututawa, an ancient pā with an extensive urupā. Further to the east was the settlement Aotearoa – a marae of the same name stands nearby today. Raukawa has a very long association to the mountain, Maungatautari. The mountain is located on the west bank of the Waikato River, south of Cambridge. This mountain holds spiritual, cultural, and historical significance to the iwi of Raukawa and others. For Raukawa, the association to Maungatautari stems back to the arrival of the Tainui waka in Aotearoa and the Raukawa ancestors Rakatāura and Kahukeke. As previously stated, Raukawa is a descendant of Rakatāura and Kahukeke. Following the arrival of the waka into Kāwhia, Rakatāura and Kahukeke left that area and journeyed into the interior of the central North Island. Along the way Rakatāura named many places. According to Raukawa tradition, Rakatāura spied a majestic mountain that appeared to be suspended above a thick blanket of mist. It was this event that prompted Rakatāura to name the place Maungatautari. Ten generations later, following the birth of her new born son Raukawa, Māhinaarangi crossed the Waikato River below Maungatautari. She named the place she crossed Horahora, in recognition of having to lay out the wet clothing of her son to dry. Two generations later, a pā named Te Tiki-o-Te-Ihingarangi, was built by a grandson of Raukawa at Karapiro, below Maungatautari. Later also, other grandsons of Raukawa namely Whāita, Tamatehura, Ūpokoiti, Wairangi, Ngakohua, and Pipito led a war party through the central North Island killing an indigenous iwi. Pā at Maungatautari belonging to that iwi were taken and Tamatehura eventually settled there. Maungatautari the mountain stands as one of the most significant boundary markers of the Raukawa takiwā. The rohe of the same name represents the district that encompasses the mountain and its surrounding lands. Covering the north western part of the Raukawa takiwā, Maungatautari district covers lands to the west of the Waikato River between Karāpiro and Arapuni across to the maunga itself and some lands to the west towards Te Awamutu and Kihikihi. Specific land blocks encompassed by this pou are Maungatautari, Puahue, Pukekura and Horahora. Maungatautari has always been a significant feature and district in the Raukawa story. The western and southern slopes of the maunga were some of the first areas settled by the descendants of Raukawa and there is evidence that descendants continuously occupied the area until the early 19th Century. The area was known to be resource rich. Fertile soils, a bird wealthy area, significant stands of native bush, and access to the Waikato River made the area incredibly desirable. This can be seen in the number of pā sites that ran along the ridges of the mountain towards the summit, as well as the numerous cultivations that were known of in the area. The cultural and symbolic significance of this area and of the maunga, as well as its desirability for strategic and resource use purposes was such that the history of this district is also peppered with a number of incidents of both inter-tribal and crown warfare, invasion, land alienation by sale and lease, conflict leading to the southern migration of some Raukawa members, and Native Land Court decisions resulting in loss of land from the mantle of Raukawa. As such, there are multiple and varying accounts from a range of different groupings relating to this district. Despite this, generation after generation of Raukawa descendants have lived, prospered, and died on or near Maungatautari. Our tūpuna have continually voiced their connections to this place and resisted iterations that attempted to alienate those connections. Raukawa have and continue to recognise the symbolic and sacred value of Maungatautari. In addition, the ecology of the area and the known history of abundant birdlife and fertile soils, as well as the Raukawa presence in the area, makes Maungatautari a place of pivotal importance to Raukawa and particularly to our exercise of kaitiakitanga. A full history beyond the Treaty of Waitangi based narrative is yet to be written. However this section covers key aspects of contemporary Raukawa history. The Treaty of Waitangi was not taken to the Raukawa takiwā and Raukawa did not sign it. Colonial authorities had little presence in the area occupied by Raukawa around the Waikato River and its basin until the late 1850s. Nevertheless, Raukawa today acknowledge the Treaty of Waitangi and value the possession of their lands, estates, forests, waters, fisheries, and taonga as guaranteed in the second article of the Treaty. The early contact of Raukawa with Europeans came through missionaries, particularly through the Church Missionary Society, which established missions in the 1830s at Matamata and Tauranga. Christianity spread through the Waikato and by the 1840s it had become influential within Raukawa and some Raukawa became Christian teachers and ministers. Like many tribes around the Waikato River, Raukawa adopted introduced crops and livestock and engaged in farming ventures that provided food to the Auckland and Australasian markets. Some Raukawa lived at Ōrākau and Rangiaowhia, which were at the centre of Māori agriculture in the Waikato before the 1860s wars. During the 1820s some sections of Raukawa and other iwi closely aligned to Raukawa migrated to the Kāpiti region. These people eventually settled in the Rangitīkei, Manawatū, Horowhenua, and Kāpiti districts. Raukawa living in the south and their kin living in the north actively maintained relationships with each other during the nineteenth century. Over time the southern and northern Raukawa developed distinct identities, though many iwi members continue to affiliate to both entities. By the beginning of the twentieth century nearly 80 percent of approximately the one million acres of land within the Raukawa takiwā in the Waikato basin had been acquired by both the Crown and private parties. By 1910 around 800,621 acres had been taken and a further 235,128 acres was lost in the following decades. Just over 40 percent of this land was acquired by the Crown and the rest by private purchasers. During the twentieth century, public works takings further eroded the Raukawa landholdings. Today people who identify as Raukawa own shares in just 76,642 acres of Māori freehold land. Much of this they share with Māori who identify with other iwi, who were also awarded interests in the original Native Land Court blocks. Two thirds of this land is located in ten blocks. The blocks include the former Taupōnui-a-Tia blocks,Maraeroa, Pouakani, and Te Tihoi, and the former Rohe Pōtae blocks,Rangitoto A and Wharepūhunga. During the 1890s the Crown took over many of the bankrupt estates of land purchasers and their companies, subdividing the land for small farmers. The Crown also provided financial support for non-Māori settlers to establish dairy farms within the Raukawa takiwā. These farms have for over a century proved highly productive, internationally competitive, and profitable. Raukawa consider that they were excluded from many Crown programmes that have benefited non-Raukawa living in the area. As the central North Island developed in the twentieth century, Māori from other iwi migrated into the Raukawa takiwā to farm and work in agriculture, forestry, and in the timber and paper mills. In 1915 the Crown provided 20,000 acres of land in the Pouakani block to an iwi with no ancestral ties to the area in compensation for land in another part of the country. As a result other iwi also established a presence on land in the Raukawa takiwā. Associated with this dramatic land loss and the significant immigration of many peoples and cultures over such a relatively short time, has been a loss of identity and culture for Raukawa. These government led social, legal and economic policies, when combined with an inadequate recognition of Raukawa as tangata whenua, have impacted upon our once thriving, rich and diverse culture and way of life. In recent years Raukawa have begun a transformation due to the Treaty settlement process. This has included the signing of the The Deed of Settlement of Historical Claims 2012 between Raukawa and the Crown (including the Central North Island Forestry Settlement). Raukawa and the Crown have also agreed to a Deed in Relation to the Co-Management Framework for the Waikato River 2009. These agreements have provided momentum and wherewithal for the iwi to actively pursue, social, cultural, environmental, and economic aspirations. It is important to note that the settlement is a small compensation for the losses incurred as a result of Crown actions and the challenges Raukawa face are significant within the context of addressing a range of historically driven capacity issues. Raukawa recognises the need to collaborate with and influence landowners, statutory agencies, and stakeholders to achieve positive outcomes and meet respective needs within our takiwā. Indeed we enjoy a diverse range of rich and rewarding partnerships and relationships which stand us in good stead for the future. Kaumātua of Raukawa refer to the whakataukī of Tāwhiao, to acknowledge that there is strength in working together and weaving new future of prosperity for our people. This whakataukī is an example of how oral traditions influence contemporary management decisions in a very real and visceral manner. We, as Raukawa, firmly believe that if we work together with the community then we will achieve our mutual aspirations. In 1987 the Ngāti Raukawa Trust Board was established under the Charitable Trusts Act (1957) as the result of the vision of Raukawa kaumātua. Its purpose was to manage the social, cultural, and economic affairs of the whānau, marae, and hapū of the Raukawa takiwā. The Board’s name was officially amended to Raukawa Trust Board in 1994. As a result of Treaty settlement negotiations with the Crown, a further re-organisation occurred and the Raukawa Settlement Trust (RST), the Raukawa Charitable Trust (RCT), the Raukawa Asset Holding Company (RAHC) and Raukawa Iwi Development Ltd (RIDL) were formed in 2010. Today, the Raukawa Group is headed by the RST, the mandated Iwi Authority, which forms the governance and representation arm of the organisation, representing 16 marae and numerous hapū. The RCT is the mandated by RST to represent and advocate for the social, environmental, and cultural aspirations of the iwi. The economic aspirations of the iwi are provided guardianship and direction through RIDL, which also receives its mandate from RST. The diagram below shows the organisational structure. There are 16 marae who have mandated RST. 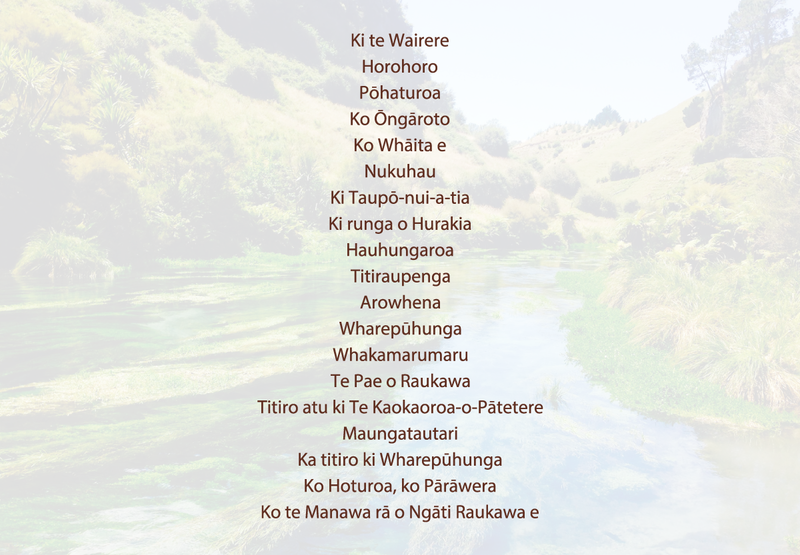 These are Ūkaipō, Tāpapa, Rengarenga, Ruapeka, Tangata, Papaaramu, Whakaaratamaiti, Ngātira, Mangakāretu, Pikitū, Ongāroto, Mōkai, Aotearoa, Ōwairaka/Rāwhitiroa, Pārāwera, and Whakamārama.